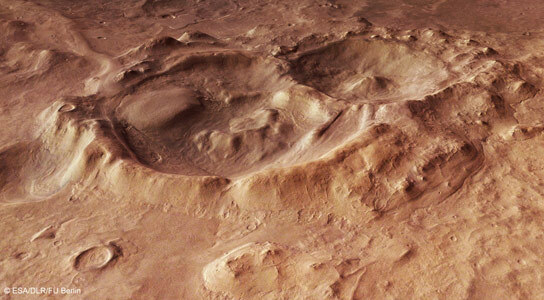 This newly released Mars Express image shows craters within the Hellas Basin in the southern highlands of Mars. Scarring the southern highlands of Mars is one of the Solar System’s largest impact basins: Hellas, with a diameter of 2300 km and a depth of over 7 km. Hellas is thought to have formed between 3.8 and 4.1 billion years ago, when a large asteroid hit the surface of Mars. Since its formation, Hellas has been subject to modification by the action of wind, ice, water and volcanic activity. Impact craters have also since pock-marked this vast basin floor, two of which are the focus of this image, taken by the High Resolution Stereo Camera on ESA’s Mars Express on 17 December 2013. The ground resolution is about 15 meters per pixel. These craters lie in the deepest, western portion of Hellas, and such a clear view is unusual because dust clouds typically obscure the basin floor. Indeed, this region seems to be covered by a thick blanket of dust. The larger of the two craters is about 25 km across. A flow of material appears to have been transported from the top left of the scene and into the crater. Zooming in to the smooth mound and the area immediately around it reveals interesting textures that likely resulted from this flow. Flow features are also seen outside of the craters, and in particular, at the center left of the image near the top of the frame. Material also seems to have cascaded from the larger crater’s rim and into a neighboring smaller crater, at the far left of the image. The morphology of many features in the Hellas Basin and its surroundings strongly suggests the presence of ice and glaciers. For example, in the foreground and around the crater rim, polygons of patterned ground are visible which indicates the presence of water – this pattern occurs when fine grained and porous wet soil freezes. Indeed, in the deepest parts of the basin, the atmospheric pressure is about 89% higher than at the surface, which may even offer conditions suitable for water. Radar images from NASA’s Mars Reconnaissance Orbiter suggest that some craters in Hellas might contain water-ice glaciers several hundred meters thick, buried under layers of dust. Be the first to comment on "New ESA Image of Craters within the Hellas Basin on Mars"